The National Grange Youth Department has selected the participants in several youth programs for the 2010 National Grange Session in Charlotte, N.C. this month. The youth represent a wide cross-section of backgrounds with one common element, the drive to lead the nation’s oldest agricultural, rural advocacy organization through the 21st century. Youth are selected for one of several programs including the Horizon Leadership Program, Legislative Experience and National Grange Youth Officer team. The Horizon Leadership Team is designed for youth and young couples who serve their State Grange as a Youth Ambassador or Young Couple. As the State Grange’s youth spokespersons, they will be recognized at the Evening of Excellence, Friday, Nov. 12 at the National Session. The Horizon Leadership Program honors youth who have served a term representing their State Youth Departments. They will compete for one of the two spots on the National Youth Mentor team. Serving as the youth mentors for 2010 are Caroline Tart of North Carolina and Christopher Szkutak, Massachusetts. This year’s ambassadors are California: Joseph Stefenoni; New York: Robert Masti and Jackie Turner; North Carolina: Camille Harrison and Dewayne Craft; Ohio: Hope Murphy and Stephen Murphy; Oregon: Lorisa Schnetzk; and Pennsylvania: Jennifer Nauss. A pair of young couples will also participate in the week-long festivities. Like the ambassadors, the young couple teams have also promoted Grange youth programs and represented the Youth Department in their state. This year’s couples are Pennsylvania’s Dustin and Julie Kunkle and Rhode Island’s Haven and Roxanne Nelson. One youth will have a front-row seat to the legislative process at the National Session as the youth representative for the Legislative Experience. Victor Salazar of Connecticut will serve on Delegate committees and assist the legislative department with the execution of the policy development by the national delegate body. Grange youth will also take center stage on the morning of Nov. 12 as they take to the floor to open the Grange Session for the day. The team slated for 2010 is as follows: Master: Valentin DeLeon, North Carolina; Overseer: Andrew Kieffer, Pennsylvania; Lecturer: Elizabeth Faulkner, North Carolina; Chaplain: Corey Spence, Massachusetts; Steward: Orrin Schnetzky, Oregon; Assistant Steward: Lynn Clark, New Hampshire; Lady Assistant Steward: Janice Knott, Washington; Gatekeeper: Jeff Johnson, Oregon; Treasurer: Cody Stevens, North Carolina; Secretary: Courtney Gray, North Carolina; Ceres: Jenna DeLeon, North Carolina; Flora: Ashley Mohn, Pennsylvania; Pomona: Ann Schnetzk, Oregon ; Executive Committee: Heidi Henderson, New York; Alissa Estes, New Hampshire; Matthew Clark, New Hampshire; and Braden Gourley, Pennsylvania. 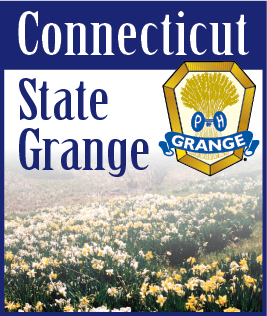 Established in 1867, the National Grange is the oldest agricultural and rural community service organization and meets annually to confer the Seventh Degree, the highest Degree of the Order; to develop its legislative policy for the coming year, and to recognize the talents of its members. There are over 200,000 members in 2,700 communities in 40 states throughout the United States. North Carolina: Caroline Tart Caroline Tart is a sophomore at North Carolina State University, majoring in agriculture education and communication. Her activities include both State Grange and FFA where she has served in multiple leadership positions. In her spare time, she enjoys attending concerts, playing volleyball, attending NC State football games and hanging out with friends. Her parents are Sandra and Denny Tart of Goldsboro. She is a member of Grantham Grange #968. In the State Grange Youth Program, she is a member of the Youth Executive Committee, Leadership Team, and Planning Committee for the Winter Youth Conference and Youth Grange Camp. Massachusetts: Christopher SzkutakA member of Uxbridge Grange #200, Szkutak has been noted as saying he was “born in a Grange Hall and never left.” He has been a Grange Member since 2002, currently serving as Massachusetts State Grange Co-Youth Director. He is the grandson of Massachusetts State Master Floyd Murphy and Shirley Murphy. His parents are Robert and Diane Szkutak of Northbridge, Mass. Szkutak recently graduated from Holy Cross with a double major of political science and mathematics. He is currently working towards a Master’s Degree in American politics from the Institute for the Study of the Americas in London, England. In his spare time, he tutors elementary school children. California: Joseph Stefenoni A fifth generation grange member, Joseph Stefenoni is the son of Martha Stefenoni of Santa Rosa, Calif. He serves as a member at the subordinate, Pomona and state levels. Last year, he was the Master of the National Grange Youth Officer Team. Outside of Grange he is a first-year student at Santa Rosa Junior College, actively involved in the Forestville 4-H as a member and teen leader and Sebastopol FFA as a project leader and competition coach. He and his mother also run a production sheep ranch. New York: Robert Masti Robert is the son of Julia and David Masti of Bath, N.Y. They live on a farm where they raise sheep, cattle and chickens. Robert and his family helped to establish a Junior Grange at North Cameron #355 in 2000. At his Grange, he has helped at countless local Grange events. At State Session, he has served as a member of the State Youth Officer Team. He was also a drill captain for the New York State Youth Drill Team that competed at the regional competition. New York: Jackie TurnerJackie is a member of North Cameron Grange #355. The 17-year-old daughter of John and Paula Turner lives on a farm in Savona, N.Y. She owns two horses, Fancy and Cash. Active at school, she is the captain of the varsity volleyball team at Campbell-Savona High School. She also plays softball and is a member of the color guard squad. Jackie is also the treasurer of her senior class. After graduation, she plans to study social work and minor in youth ministry. In Grange, she has been very active serving as a drill captain for the New York State Youth Drill team, Junior Grange camp councilors and several state youth events. North Carolina: Camille HarrisonCamille Harrison is the daughter of Rick and Genia Harrison of Newton Grove, N.C. She is a junior at East Carolina University, where she is enrolled in the College of Nursing. Outside of school, she is active in the Local Grange and State Grange. She said she loves getting to meet the wonderful people from across the state and nation, and loves being a positive influence on the youth of North Carolina. When not busy with school or Grange, she enjoys reading, crocheting, swimming and spending time with family and friends. She also volunteers for service projects through the organizations she is involved in. North Carolina: Dewayne Craft Dewayne Craft is a senior at Pitt Community College, studying business. Outside of school, he is involved in church and Grange. He assisted in chartering the newest Grange in North Carolina and is excited to have one near his home. He has been active in the State Youth Program serving as a Youth Officer and on State Youth Committees. Some of his event participation includes State Winter Youth Conference, Family Conference, State Leadership Caravan and State Convention. He is also active in his church, participating in the Sunday school, youth, service projects and vacation bible school programs and events. Ohio: Hope Murphy“Learning and teaching are a passion,” said Hope Murphy of Riverside Grange #1552. The 16-year-old daughter of Raymond and Elizabeth Murphy is enrolled in a high school program to earn college credits for teaching. As Ambassador, she attended county Grange banquets, Winter Youth Camp, Summer Youth Camp and Convention. When not participating in Grange events, she enjoys writing poems, reading mysteries and playing the violin. She noted that her family has been a great support for her with all of her activities. Ohio: Stephen MurphyStephen Murphy is the 16-year-old son of Raymond and Elizabeth Murphy of Zanesville, Ohio. He attends Zanesville High School, where he is in the 11 th grade. He plays baseball most of the year, playing soccer in the balance of the year. In his home Grange of Riverside #1552, he has served as an Assistant Steward and on his Pomona Publicity and Community Service Committee. At the state level, he has served as a State Youth Officer. Oregon: Lorisa SchnetzkyLorisa Schnetzky, 20, has been a Grange member for the past for years. She is a graduate of Portland Community College with her Associate Degree. She has said, “out of all of the organizations I have been in, there has not been one more welcoming than the grange.” She has served in several offices for Tigard Grange #148. At State Grange, she has served on the Health and Wellness Committee and Education Committee. A former Girl Scout, she has earned her bronze award. She has also served as a story reader at the local library. Pennsylvania: Jennifer NaussJennifer is the daughter of Brad and Anna May Nauss and is a senior at Penn State. She is also a Schreyer Honors Scholar. Jenn is majoring in communication sciences and disorders (speech-language pathology) with minors in special education and human development and family studies. She is a fifth generation Granger and member of the Seventh Degree. She holds various leadership positions, including Master of the Penn State Grange #2105 and Secretary of York-Adams Pomona Grange #40. In addition to Grange involvement, Jenn participates in several other community and professional organizations and she enjoys spending time with family, watching old movies and reading novels. Pennsylvania: Dustin and Julie Kunkle Dustin and Julie Kunkle live in Tilden Township with their son Connor. They have been married for 11 years and are both lifetime members of Shartlesville Grange # 1512. Julie has been a Granger for 13 years and Dustin has been involved with Grange since age 6 and is a 4 th generation member. Both have served in leadership positions in their Local Grange. Dustin is currently Master and Julie is Assistant Steward. They also serve as the Assistant Stewards for Berks County Pomona # 43. Dustin currently serves as State Grange Deputy for Berks County. Both hope to continue to be active on the state level, taking on greater positions of leadership. Rhode Island: Haven and Roxanne Nelson Haven and Roxanne live in West Kingston and are members of Richmond Grange # 6. They met 10 years ago at the Northeastern Youth Conference. Roxanne was born and raised in Rhode Island, while Haven was born in Maine and moved closer to Roxanne after meeting. They have been married for 4 years. Most recently they were the Rhode Island State Grange Youth Committee Co-Directors. Both have been very active in their Subordinate and Pomona Granges serving in many different officer positions including Steward and Lecturer. Both are former Youth Ambassadors. As Young Couple, the Nelson’s hope to continue to serve as an example for the youth in their state and encourage them to follow their dreams, believing in the importance of youth in the Grange. Victor Salazar of ConnecticutSalazar graduate d from Northwestern Regional High School in 2009. He is a sophomore at the University of Hartford where studying politics and government. He grew up on a sheep farm, and is employed at a Black Angus farm. Salazar is active in FFA serving as the Connecticut State FFA president. He is a 6th generation Grange member. For a career goal, he hopes to some day be an elected official in the State of Connecticut. Master: Valentin DeLeon- North Carolina Valentin DeLeon is a member of Edneyville Grange #1051. He serves as North Carolina State Grange Assistant Steward and is a former National Grange Youth Mentor. He has won every award that the NC State Grange offers for Youth Members. Overseer: Andrew Kieffer- Pennsylvania A member of Marion Grange #1853, Kieffer has served in several offices in the subordinate and Berks County Pomona. He has served on the Pennsylvania State Grange Youth Officer team for the past several years. This year, he was appointed by the State Master to the Agriculture and Environment Committee. Lecturer: Elizabeth Faulkner- North Carolina Faulkner, a member of Rockingham County Grange #1293, currently serves as the NC State Grange Youth Flora. Her activities include drill team and Youth Grange Camp planning Committee. She is also the winner of the 2009 National Grange Youth Leadership Award. Chaplain: Corey Spence- Massachusetts Currently serving as Master of Bedford Grange #283, Corey Spence is also Gatekeeper of the Massachusetts State Grange. He has previously served on the Legislative and Communications Committees for the MA State Grange. Spence will also be representing MA during the talent portion of the Evening of Excellence. Steward: Orrin Schnetzky - Oregon Schnetzky is a member of Tigard Grange #148. Locally he is the Subordinate and Pomona Assistant Steward. At the state level, he is the State Youth Assistant Steward. He also was a member of the state drill team. Assistant Steward: Lynn Clark – New Hampshire Lynn Clark is from Surry, N.H and a member of Prentice Hill Grange #257. She currently serves on the New Hampshire State Grange Youth Committee. She has served in leadership roles in her subordinate Grange including Master. Lady Assistant Steward: Janice Knott- Washington A member of East Hill # 786, Knott serves as the current Master of that Grange, having previously served in many other leadership positions. At the state level she has served as Gatekeeper, Ceres, and other officer positions in the Washington State Youth Grange. She is also a Junior Grange Leader. Gatekeeper: Jeff Johnson - Oregon Steward of Milwaukie Grange # 268, Johnson is also a member of the Oregon State Grange Youth Officer team serving on the Executive Committee. He is also a Marshall on the State Officer Installation Team. Treasurer: Cody Stevens - North Carolina President of the North Carolina State Grange Youth, Stevens is a member of Grantham Grange #968. He is a former Youth Ambassador and National Youth Mentor. Additionally, Stevens served as a National Grange Building Ambassador for the 50 th Anniversary celebration. Secretary: Courtney Gray - North Carolina Courtney Gray is a member of Southern Wake Grange #1295. She has participated in the State Grange Youth Program this year as a member of the state drill team, state youth team and the state youth Vice President. Ceres: Jenna DeLeon – North Carolina Jenna DeLeon is a member of Edneyville Grange #1051. She has served several years on the North Carolina Youth Officer Team. For the past three years, she has been their youth Ceres. Flora: Ashley Mohn -- Pennsylvania Ashley Mohn is a member of Marion Grange in Stouchsburg. She is a past National Junior Grange Ambassador. She has been active in several State Grange youth activities and Berks County Pomona Grange events. Pomona: Kiri Ann Schnetzky - Oregon Schnetzky is a member of Tigard Grange # 148 where she serves as Lady Assistant Steward. She has also served as Lady Assistant Steward in the Oregon State Youth team. Schnetzky was also a chaperone at last year’s State Session. Executive Committee- Heidi Henderson - New York Henderson is a member of Baldwinsville Grange #1251. Her activities include serving as Subordinate Master and Flora of her Pomona Grange. She is active in her State Grange Youth program, serving in several offices. Executive Committee- Alissa Estes - New Hampshire Alissa Estes is a member of Somersworth Grange #264. She is active in her state’s Youth Program, serving on the Youth Committee and as Lady Assistant Steward. Offices held are Subordinate Steward and Master of her Pomona Grange. Executive Committee- Matthew Clark New Hampshire Clark is from Surry, N.H and a member of Prentice Hill Grange #257. He has served in leadership roles in his Subordinate Grange including Master. Clark also is the state Grange Chaplain and has served as the Installing Chaplain for the National Officers. Executive Committee - Braden Gourley- Pennsylvania A member of Hookstown Grange #1980, he is a member of the Subordinate Finance Committee. For the Beaver County Pomona he is the Youth Chairperson and assisted with the Junior Grange activities. He is a former Pennsylvania Junior State Grange Prince and Youth Ambassador.